On our two day drive from Chicagoland to Colorado, I anticipated at some point our three year old would have a melt down from being strapped in a car seat for hours on end! And while frequent Rest Stops helped pace the trip, I knew sooner or later, the tears would come. So like any wise parent, I was prepared! 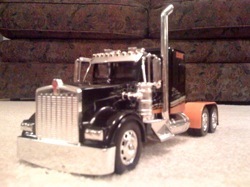 I had purchased a huge semi-truck toy and stashed in in the back of the mini-van so when the revolt came, I could reward him for being so good and give him a toy to enjoy for the last leg of the trip. Well, it finally happened. At our last lunch stop, we were looking at toy trucks at a truck stop and when we said it was time to get back in the car the melt down started, but I was able to kneel down, hug my son, and say, “Luke, you’ve been so good. Please don’t cry. I’m so proud of you and how you’ve done these past two days on our trip. Guess what? I have a surprise for you in the car – a truck! If you can stop crying and make it for one more stretch of driving I’ll give you a cool semi-truck in the car.” It was so precious to watch him whip his tears and follow me to the car and when he saw it to light up and say, “Wow! It’s sooo cool!” And we hit the road again. 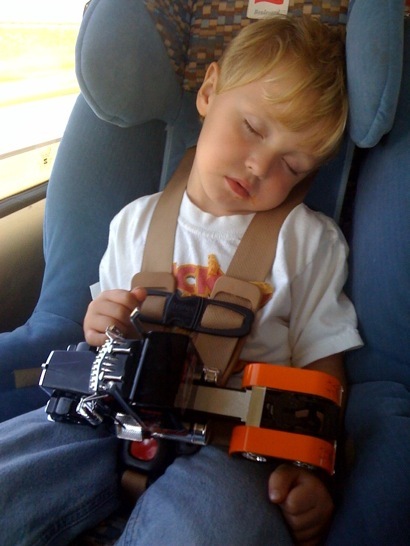 Soon, as facebook friends saw, he was asleep with his new truck/friend. In an effort to help his nice cars and trucks last a little longer, I had explained to him that it was an expensive truck and to be very careful with it so that it would not break. Well, when we got to Colorado we were welcomed by some relatives and all went out to dinner. At dinner, while playing, the truck took a nose dive off the table and everyone heard the crash and turned to see what happened. Luke’s response was so cute, and also so representative of our human response when we mess up. Without even looking to see how the truck was, he immediately ran to me and started hugging me and laying on the love, telling me, “Daddy, I looooove you! You are the best daddy!” and kissing me. Of course, it was very sweet and cute, and yet at the same time, we knew, this sudden expression of love was most likely motivated not by a desire to express love, but by an immediate desire to squelch my anticipated displeasure that the new truck had crashed off the table. However, I accepted his affection and simply asked him to go get the truck, so we could see how it was. Sure enough, one of the tall exhaust pipes had broken off – something easily glued later on. I told him it was O.K., and I knew it was an accident, and I wasn’t upset, but he could be a little more careful. While it isn’t my pattern to get angry or react quickly or get upset in situations like this, I did find it very interesting that he understood right away that I had given him this gift out of love, and he had broken it, and immediately – INSTANTLY, when he thought he had broken it, his response was to express love to me. Perhaps it was defensive love, to soften me up and avoid getting in trouble. Or, perhaps it was perfectly sincere, because he felt badly that my loving gift had been hurt, and so he instantly responded by giving his own gift of love. I could argue it either way. Ultimately, its irrelevant. Either way, the point is, that when he broke the gift, he turned to his father and tried to make it right by expressing love and his father cared more for his son than for the object and accepted the love and immediately returned love. The ‘thing’ was less important than the relationship. Why am I blogging about this little incident? Because every day we fail our Heavenly Father. We break, misuse, and break His gifts. And how do we respond toward our Heavenly Father? Our INSTINCT ought to be the same as my little boy! Turn to our Father and simply express love. Whether it is a little defensive to try and and stave off his anger, or whether it is simply to acknowledge we carelessly damaged what He gave us – either way, He will accept us and return our love. For He cares less about the things and objects of our lives and more about His relationship with us, and whether we are willing to embrace Him and say we are sorry. Have you told your Heavenly Father you love Him today? And that you are sorry for breaking the truck He gave you?